If you have never had an aquarium it can be difficult to buy a great gift (one that will actually be appreciated and used) for someone who does. Not to worry. Here are some gifts that almost every (especially ​salt water) aquarist will treasure. Most of these gifts are things that will be used almost every day, others are things that the giftee won't need every day but will be glad they have them when the odd "must have" occasion arises. 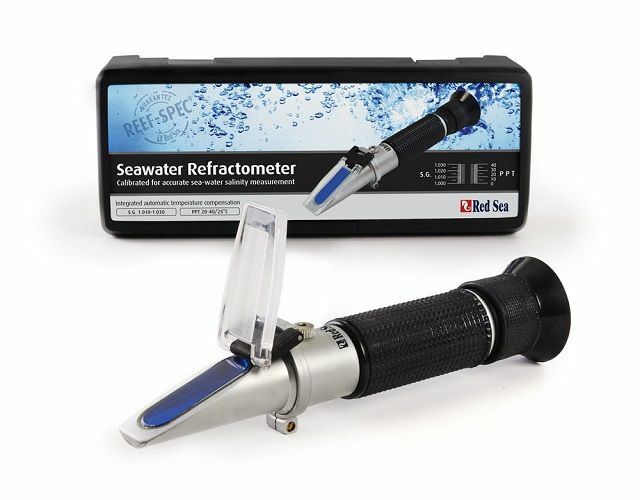 Salinity refractometers make a terrific gift for any saltwater aquarium enthusiast. Saltwater aquarists measure the salt concentration in their aquariums on a regular basis. Because of their easy use and low price, swing arm hydrometers have been used for this purpose for years but since more and more saltwater refractometers are being produced at affordable prices their popularity is rising. Refractometers use water to bend light which is then measured to determine the amount of salt in the water. Most saltwater aquarists greatly prefer refractometers over swing arm hydrometers due to their accuracy (no minute bubbles stuck to the swing arm to skew readings) and ease of use (put a few drops of aquarium water on the glass, hold it up to the light and read the results. Refractometers can easily be calibrated with distilled or R.O. water to maintain high accuracy. Every aquarium needs to have algae scraped from the glass from time to time. The usual tools for removing algae are a long handle scraper (awkward) and/or a scrubby pad (wet arm and shirt sleeve). The Floating Magnetic Aquarium Glass Cleaners are a terrific invention that every aquarist wants. With these cleaners, there is no need to chase the cleaning pad to the bottom of the tank when it gets loose from the magnet... It floats on the surface. When the cleaner is not being used, just "park it" in a back corner of the tank where it is easy to find the next time it is needed. Automatic Fish Feeders are something that almost every aquarist wants but never quite gets around to buying. These feeders are very handy for feeding fish and invertebrates in an aquarium when the owner is away on vacation (or a long weekend) and can't be home to feed. Many aquarists have found that they are very handy for every day feeding. The tank gets fed a measured amount of food on a regular basis which is good for the critters and makes life a little easier for the aquarist. The Mini/Nano aquariums are perfect for the office or desktop. Many of these kits come complete with filtration, lighting, and heaters. All you have to do is add a substrate, decorations (live rock), water and critters. Many of the suppliers include free shipping with these kits. Hexagon and Bow Front aquariums offer a whole new experience for aquarium keepers. The greatly improved viewing area makes these tank a pure joy to populate with some really terrific and interesting critters. Many of these kits include filtration and lighting fixtures. The new LED tanks are really impressive. Due to the potential for "salt creep" air pumps are not used as much in saltwater aquariums as they are in freshwater aquariums for aesthetics (air stones or bubble walls) however they are used in the operation of many protein skimmers. Most hobby grade air pumps use a vibrating rubber diaphragm to produce compressed air. These diaphragms become cracked over time and cease to produce air. While these types of air pumps are relatively inexpensive, they normally don't produce a high volume of air for very long and will need to be replaced on a regular basis. Piston driven air pumps, on the other hand, reliably produce a high volume of air at a good pressure for a long period of time. These pumps do cost a bit more, but they are considered to be the Cadillac of aquarium air pumps and make great gifts for aquarists who rely on an air pump to drive equipment. For freshwater aquariums, these long-lasting air pumps reliably produce a huge amount of air for numerous air stones and decorations. Saltwater aquariums (especially reef tanks) need water movement in order to work properly. Aquarists use powerheads to create water currents which can be directed to benefit the corals and other occupants in the tank. A powerhead is always an appreciated gift for nearly every saltwater aquarium enthusiast. In order to keep their saltwater aquariums running at peak efficiency, many aquarists add various supplements (kalkwasser, trace elements, pH balancers, even liquid foods) to their tanks on a regular basis. Automatic dosing pumps take the drudgery out of dosing tanks by feeding the right amount of liquids to the tank on a regular basis. A Red Slime Algae outbreak is something that everyone with a saltwater tank dreads.One of these Top Red Slime Algae Removers makes a great stocking stuffer for anyone with a saltwater aquarium.This is something that every saltwater aquarist will need at some point. It is something you don't really think about until you need it and wish you had on hand. Protein skimming is simply using air bubbles to collect proteins in aquarium water and bring them to the water's surface in a container. The "skimmate" (the stuff removed from the water) contains the proteins that the biological filter in the aquarium system would otherwise have to process to remove toxins (ammonia) from the aquarium water. Reef tank owners love skimmers for a good reason: they take the gunk out of the tank water so the corals can grow better. RO/DI water is highly filtered water which has had a vast majority of the contaminants removed through filtration. The use of RO/DI (Reverse Osmosis/De-ionization) water is very popular in saltwater (particularly reef) tanks as opposed to de-chlorinated tap water. Lacking the equipment to produce RO/DI water, RO/DI water is normally purchased at a fish (pet) store which can become expensive over time. RO/DI units are simple, fairly inexpensive and provide the benefits of convenience (you can make all the RO/DI water you want in your own home) at a fraction of the price of store-bought water. What is a Marine Aquarium Refugium?